The first prototypes of our new sensor heads are coming together and we should be able to get some test data off of them soon. 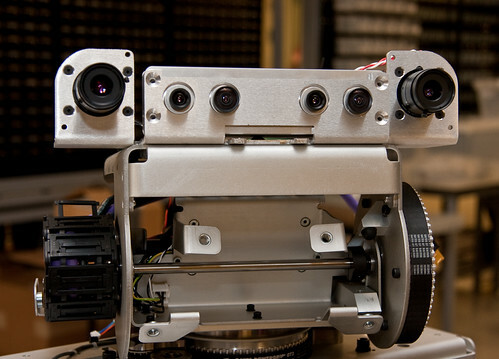 The lenses that you see here (left-right) are a 5 megapixel Prosilica camera, a dual-stereo Videre camera (wide-angle color and narrow-angle mono), and a red LED pattern projector. The exposure of the narrow-angle stereo pair is synchronized with the flashing of the pattern projector and the rest of the lenses are "anti-synchronized," i.e. they expose when the LED is off. You can read our previous post on the design of the new sensor head to get a little more background on everything that led up to what you see here, as well as a preview of what it will look like when it gets all prettied up.